Harriet Lee-Merrion is a British illustrator. Her work is rendered in a wash of pastel colors and delicate black lines influenced by botanical engravings, surrealism and Japanese woodblock prints, often depicting dreamlike and surreal imagery. Harriet has worked with international clients including Google, TED, The Guardian, Bloomsbury and The New York Times, while her work has also been exhibited internationally in New York, London and Berlin. 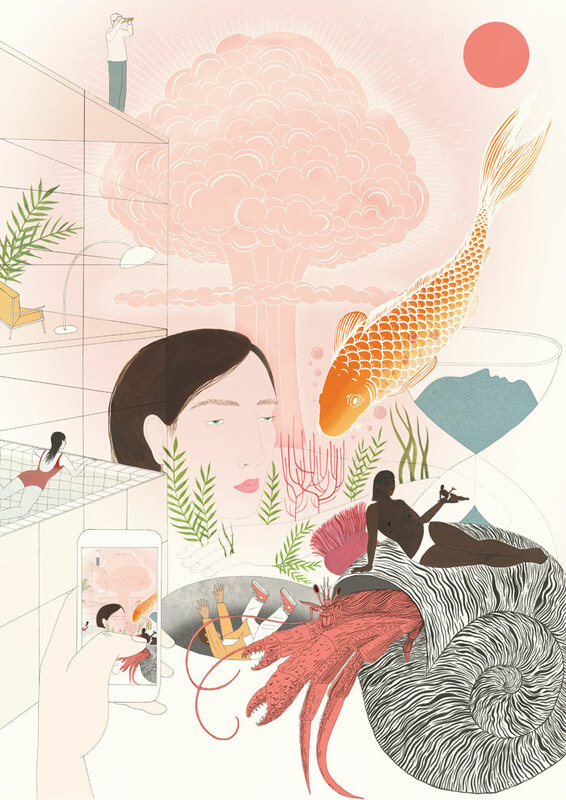 She is the recipient of a 3x3 International Illustration Award for Editorial Illustration and in 2016 was awarded a Distinguished Artist Scholarship by VYT to take part in an artist residency in New York. Harriet has been represented by Heart agency since 2014, she lives and works in Bristol, in the South West of England and has been working as an illustrator since graduating from Falmouth Arts University in 2013. While at Varda Artist Residency Harriet will be working on her first collection of illustrated poetry. ‘Harriet creates meditative, poetic and deeply evocative visual narratives exploring the themes of identity and femininity. slices of invented cities echo oriental inspirations.